Royalty, Intrigue, Mystery- this book has it all. Lucy Worsley, a beloved Historian and presenter of such programmes like Six Wives and British History's Biggest Fibs, turns the famous story of the young Princess Victoria on its head and reimagines what could have happened in a vivid and creative way. Her writing style is accessible to all ages and she manages to keep the reader interested through a series of sections located in different places. I thoroughly enjoyed reading it as it mixed historical evidence with imaginative ideas producing a solid book suitable for all occasions. The focus of the story is on Miss V Conroy, the daughter of the assertive Sir John- Comptroller of the Duchess of Kent's household. She is made to go and live with her father and become the Princess Victoria's companion. After a difficult start, Miss V bonds with Victoria and they become close like sisters. However, all is not so sweet as Miss V discovers that her father enforces Victoria to live under a strict regime in order to make himself powerful in the future. Miss V is uneasy with this and is faced to make a decision, continue in silence in loyalty to her father or speak out to protect the princess and future Queen. This story deals with issues such as friendship, loyalty and deception. Worsley's writings brings these issues about creatively with Miss V evaluating her thoughts and emotions at the end of each chapter. Miss V is an intriguing character, she is able to grasp new situations and is very mature of her age yet she still relies on her father for guidance. However, this changes throughout the book as she becomes close with Victoria and becomes suspicious that her father might have ulterior motives. Victoria is a frightened child, forced to live cooped up with only a few individual allowed to interact with her, all under the order of Sir John. She is scared for her future and worries that she will not be able to become the strong Queen that Britain so desperately needs after of turbulent reigns before her. Sir John is a twisted character portrayed as evil because of his desire to move up the social ladder and become powerful. Because of this, he makes bad decisions that affect his relationship with his daughter and family. The story is set in the reign of King William IV, in the 1830s. Miss V and Victoria are both in their early teens and they mature throughout the book, finishing when Victoria is 18. The setting is primarily located in Kensington Palace where Miss V and Victoria live. Though this changes partway through the book where the girls visit Ramsgate before returning back to Kensington. Miss V later returns home to Arborfield Hill to her mother and siblings. The setting of Kensington Palace described in the book is different to the one I had visualised in my head. It seems much smaller and less grand which provides the backdrop to Victoria's dreary lifestyle. Although the book is not based on true evidence, it still gives some historical information. For example, there is a family tree at the front of the book which I found extremely useful to check Victoria's many relatives. The premise of the book is clearly stated as being a parallel telling to the potential truth but it does provide an interesting re-imagination of the Princess's younger life. I would certainly be keen to read more into Miss V Conroy as this is something that was completely new to me. I would very much like to see the author take some of her work to the screen and develop a new documentary about the relationship between Victoria and the Conroys. Overall, I found this book intriguing, imaginative and unique. I liked how the book was set out into easily digestible chapters and creative language was interspersed between action and description. I would recommend this book to children aged between 8 and 14 as it is quite an easy read, comfortably read in one weekend. To sum up in one sentence: A creative and imaginative novel giving a new insight to an old classic. I really enjoyed reading this book because the writer has portrayed the characters in such a simple but delightful way that you can really connect with. I thought the history in this book was extremely realistic and it had a surprising twist in the end. I loved the way the characters spoke in an olden language but I could still understand it. This book definitely made me want to find out more about Queen Victoria's history. I would definitely give this book a 5/5. I have also read another great historical book by Lucy Worsley: Eliza Rose. I love books about Queen Victoria and this one was as good as I hoped it would be. I thought it was a change to have a story about Victoria as a little girl not a queen and it was good. I liked some of the descriptions of Kensington Palace and the type of life a girl like her might have. I was not sure I would like all aspects of it I thought it was sad that she didn't get to find her own friends but people were brought in to play with her. This is a story about friends. I didn't really like Miss Conroy because I couldn't really tell what her personality was supposed to be, but she was very nice to Victoria who wasn't always an easy friend to have she could be moody and grumpy. The book made me think it might not be that good to be a princess with people telling you what to do all the time. I thought Mr Conroy was very strict and bossy and I felt sorry for the Duchess but a bit cross with her at times too because she should of stuck up more for Victoria. I think you could tell that this book was written by someone who knows a lot about history. I have watched Lucy Worsely on television and I think this helped me like the book. She makes history fun and I would like to read more of her books now. I would encourage other people in maybe year 5 and 6 to like this book too. I think this is just a book for girls and didn't really like it that much. I think my little sister might like it though. The story was about Queen Victoria when she was a little girl and the people who looked after her. There are lots of people checking up on Victoria and she has worked out that even the people who are supposed to be nice to her are actually telling Mr Conroy [not nice][ what she is doing. One bit I did like was when Mr Conroy tried to make Victoria make him more powerful, then she seemed quite strong and that was good. I thought the start of the book was a bit slow and I wasn't sure that I liked the end that seemed a bit strange to change what actually happened. This made me think about what other stories had changed what happened in history and I might of liked that a bit more. This historical fictional work tells the tale of two girls, sharing the same name, one of whom becomes Queen Victoria. The story begins in 1830, when an aged 11 Victoria (Miss V) becomes Princess Victoria's lady-in-waiting. Miss V and Victoria soon become good friends but are forced to hide their friendship, due to ˜The System'. The System prevents Victoria from having any fun, friends or being allowed to venture from the large manor house she resides in. Miss V's father created The System and throughout the story, Miss V grows to hate The System and her father. Miss V and Victoria long to be together more and to share a room. One night, when Victoria's nurse takes ill, Miss V receives the privilege of a sharing a room with Victoria for one night. In the dead of night, an intruder sneaks into Victoria's room with intent to assassinate the future queen. Luckily, Miss V stops the intruder and saves Victoria's life. Because of this, it is now thought necessary that the two girls share a room permanently. Throughout their teenage years, they discover that Victoria is to become queen and that Miss V and Victoria are cousins. At 17, Victoria must get married to a man she does not love to the dismay of Miss V who is in love with Prince Albert. When Coronation Day arrives (before the imminent wedding), Victoria and Miss V switch places and it is a happy ending for both Victorias. My opinions: I enjoyed the book because it made you think if all of the historical events are completely accurate. The story line was interesting and eventful. My favourite event was the attempted assassination on Princess Victoria. I thought that the history in the book was very exciting but not necessarily true. The book made me want to find out more about history and investigate whether events in the book are supported by other sources. I would like to read more books by this author, however, I am tempted to read other books about Queen Victoria first. I would recommend the book to girls aged 11 - 14 as they can relate most the story. Personally I enjoyed this book because the story line is very imaginative and creative. My favourite part of the book for me was chapter 2b (the Grand Fancy Dress ball ) because the title immediately stands out to me and at the start of the chapter it mentions Miss V going to the ball with her father and that really makes me think more. I think it targets history differently than other books because it does mention Queen Victoria but this mainly focusses on behind the scenes. I think Lucy Worsley books are interesting and show a different side to history that most people don't think about I totally recommend people read it. I enjoyed the book because it was really fun reading that book and it makes you want to read the book over and over again. It tells a lot of personal things like what her secret is and it even tells things that you can learn from it. It teaches you stuff like, sometimes parents can be mean like in the book, Victoria couldn't be the princess or the next queen because of her name. Her father didn't say anything like 'I think that this is nonsense' and what I love especially about the book is that it is an interesting story. I like it when it says that Victoria can't be the queen and her uncle comes up and says that 'I think this is wrong, Victoria should be the next queen, even if there is something wrong with her name. That's not something to be ashamed of'. Maybe her uncle could go and ask anyone what would happen if that person was them. That way they can understand how it feels like to not be the queen even though you were supposed to be the queen but, you can't because of one thing that was wrong. The uncle could tell one person how it feels for Victoria and maybe he could tell that person a story. It could be like how about if you want to get a passport and you name was supposed to be spelled like Victoria but, it was wrong it was spelled like Victoria and you can get a passport because you name is wrong and that's not fair. I kind of didn't enjoy the book because it had some parts when the author tells you what was happening and sometimes what's happening can be scary. I get scared quite easily and if it's really scary sometimes I can't even sleep for a week, so I wish that the book was less scary and more fun and happy things happening in the book. Like Victoria could get to be the queen even if there was a problem with her name and when the author is telling what's happening I wish it was more fun. The book is very good and full of wondering what will happen next. My favourite historical queen is Victoria. So this draws me in to reading it. when I started to read this book I couldn't stop reading it. My favourite character has to be Miss V Conroy.The reason is because she has such a calming manner and the fact that she thinks she knows her father very well when she doesn't know her father at all that, he gives the duchess medicine that makes her drowsy and tired and that he gives the same drowsy medicine to his wife. Miss V's mother. The thought of a young girl taken away to Kensington Palace, to give away her own dog for the princess, Victoria , who he doesn't even know is truly heartbreaking . The princess is very independent. You find out all the secrets about Kensington Palace and who lives in it. I got confused at the start of the book when it said that Miss V was playing with Dash. I thought that Miss V is Victoria because I read other books about Victoria and it said her dog was called Dash. My favourite part was when Miss V had to pretend to be Princess Victoria and how they looked exactly the same. I would recommend this book to people who like queen Victoria. There are lots of books set when she is Queen and after but not many before and not written in Victoria's perspective but in a servant's perspective or Victoria's best friend.I would say it is for ages 9 and upwards I also think some adults would like this book. I wouldn't say it is all non - fiction there is a bit of fiction too. I would give it **** stars. This book was exciting from start to end. It was amazing to see how each character and their relationships developed throughout the story. The surprises that occur and the way the narrative unfolds is incredible. My favourite character was Miss V. Conroy. She was so modest and mature from start to end, and always tried to select the right decision. However, her confidence grew dramatically as the story was told. Her relationship with Victoria grew stronger, from strangers to practically sisters and how devoted Miss V. was to her father at the beginning, but when she realised what he did and why, she gradually became less fond of him. Although the storyline was very interesting, I don't think the history of the book is particularly accurate. I don't believe that much of what happened would actually appear in real life in that time period. For example, the unfortunate position Victoria was in for becoming Queen. Apparently, she just wasn't fit to be queen and so at the end of the novel Miss V. took her place. Obviously, this would never occur in a historical time line due to royal birth rights and heirs, but it was an incredible plot twist. Also, the way Kensington Palace was described as a prison, and the fact that Victoria had no freedom. Personally, I think as a future Queen, she would have been treated with more loyalty by her mother, servants and maids. However, in relation to historical accuracy, Queen Victoria's childhood wasn't very pleasant anyway. I researched, Queen Victoria when she was a small child, and she was described as very beautiful, with piercing blue eyes, and pale translucent skin. I love the fact that this is recreated in the story. This book made me want to find out all about Queen Victoria's reign, family and relations. Learning about her childhood was astonishingly interesting and I can't wait to learn more about her. This book also made me want to read more books written by this author, Lucy Worsley. I love the fact that she has followed the facts of Queen Victoria's life, but added plot twists here and there to increase the depth for the reader and as a fictional novel, making it more exciting for a child my age to read. I would recommend this book to anyone interested in the history of our past monarchs, and I'm sure they would enjoy it as much as I did. 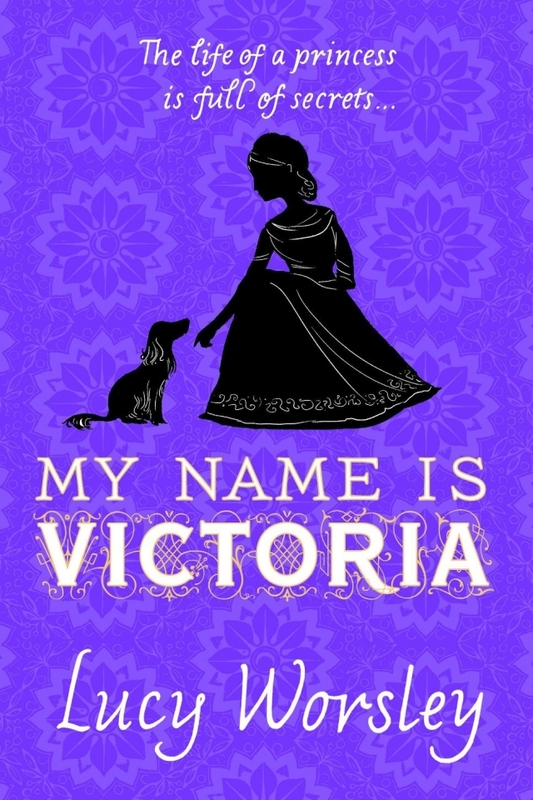 This book is called 'My Name is Victoria' and is set in the 1830s. The author Lucy Worsley has written many books such as 'If Walls Could Talk', 'Jane Austen at Home' and 'Eliza Rose'. All her books are based on true historical events. The story is narrated by Miss V. Conroy who is forced by her father, Sir John Conroy, to play with Princess Victoria. Princess Victoria at first comes off as a confident character who doesn't want to be friends with Miss V. Conroy, yet as the story progresses, they become best friends and Miss V. is protective of her. This book is based on Queen Victoria's childhood; however, the book's history has been watered down and there are many changes to historical events. This book has a lot of historical background and true historical realism. An example of this would be the sofas stuffed with horsehair and activities the children used to do such as reading Shakespeare. The description of Kensington Palace is quite accurate as well as clothes worn such as the lace pantaloons women used to wear, and the bonnets worn. Also, it includes information about previous kings and Victoria's family members. However, some of the historical language isn't correct such as the insults used, yet this is so it can appeal to a wider audience. This book has been quite modernised to suit a wider range of ages. Personally, I found the book extremely memorable and captivating. This book really makes the reader think for themselves and gets them to really imagine they were there, in the 1830s. I would recommend this book to readers over the age of 12 and anyone with a curious imagination. However, this book could be improved with some more historical content that was true to the time such as ideas thought by Princess Victoria and the language used as there wasn't very many words from the Victorian era. I thought the book was great and all I wanted to do was keep on reading. The book inspired me to research Victoria's life through childhood to her reign as Queen.